Kimberley has shared this lovely video of Baby Cole starting to crawl. And he's off……..? ?#crawling #mum #boys #crawlingbaby #onthemove #timeflies ???? Cole is almost eight months now and has changed so much over the past few weeks! He’s started clapping and even recognises the word and responds by showing off his new party trick which I think is amazing. Babies’ brains are developing so quickly at this age and you can tell they really understand a lot of what you’re saying now which I love. There have been lots of developments with Cole over the last fortnight, he’s just cut both his front bottom teeth too bless him. I could definitely tell he was little bit troubled by them as he was sleeping really well and then suddenly starting waking again and wanting lots of cuddles. It must be painful for them. My sister Sally recommended Anbesol liquid which is brilliant! You can get it from the chemist and it’s the only thing I’ve found that actually numbs the gum to take the pain away. He’s started sleeping again now that they’re both through… until the next one cuts that is! He’s also very close to crawling and getting frustrated that he hasn’t quite got the hang of it. He crawls backwards and pivots round in a circle but can’t quite work out the coordination to go forward. He’s done a couple of tentative moves forward but then just rocks back and forth on all fours getting very annoyed! I have to say with Bobby I was desperate for him to start crawling but I know how hard it is once they’re on the move as it’s my second so I don’t mind if Cole wants to take his time! It’s a whole different ball game once they’re crawling and you cannot take your eyes off them for a second! He’s still the smiliest baby ever. As it’s the school holidays we’ve had our nephew Tristan, Justin’s sister’s son saying with us for the week. Tristan is ten and absolutely amazing with Bobby and Cole and they adore him. He’s such a lovely boy and a dream to look after so we’ve had a really fun week! We went to Chessington World of Adventure the other day which was fab! Bobby was so excited to go on the Gruffalo river ride and he loved it! He pretty much knows the Gruffalo story off by heart so he’s the perfect age for it. There were loads of other rides for his age too which was brilliant! I love rollercoasters so Justin and I took it in turns to go on the big rides with Tristan, I forgot how much fun they are! I wasn’t sure if I’d have lost my bottle but once I’d been on one I got a taste for it! I can’t believe Sarah is in the Big Brother house! I’ve managed to watch a couple of episodes and it’s actually really bizarre seeing someone you know so well in there. I think she’s really brave to put herself out there like that as it’s a lot of pressure and such an intense environment to be in. Sarah can sometimes be easily overwhelmed so I really hope she’s ok in there and enjoys the experience. She’s been great on the bits I’ve seen so far. I also know Helen Lederer as we were in Horrid Henry the movie together and I’ve worked with her again since and she’s hilarious, a really lovely woman and has been in the business a long time so I’m sure she’ll look out for Sarah. Yesterday, a new ride opened up at Chessington and Kimberley took her son Bobby for an exciting day out. The ride is called ‘Gruffalo River Ride Adventure’. So I just got back from my family hols and we had such a brilliant time! We went to Portugal to an area I’ve been to several times before. It was our first holiday with Cole so I wanted a bit of familiarity as it makes everything so much easier. We had a villa with our own little pool in a resort with another big pool and loads of things for the kids to do. Having our own pool at the villa meant we could make the most of the time to relax while the boys were napping which was great! Bobby has never been interested in the pool before and he’s still a little nervous but we made real progress by the end of the week and he started to really enjoy it and getting a little bit more confident. At the beginning of the week he would only sit on the first step and watch us all swimming but my the end he was jumping in and letting me catch him and loving it! He mostly enjoyed squirting me with his water pistol while I was sunbathing though unsurprisingly! I was a bit nervous about how we’d cope on holiday with both of them as they’re still so young but we had Justin’s daughter Chloe with us too so it was fine. It’s still always challenging having to mess up their routine to go out for dinner though. I have to say most dinner times meant Justin and I playing jack in the box getting up and down with kids to keep them entertained. It’s tricky when they’re so young though as they get bored just sitting and having dinner. Despite that we had such a fab time and the boys loved it too. Cole is doing really well with his food so it was nice that we could involve him in our dinner time a bit, he would sit and munch on his little baby crisps and Bobby loved ordering his own drink and food and feeling all grown up. He would usually be more interested in dessert than his meal though but I guess that’s true of most 2 year olds! It’s always bittersweet coming home cos I never want holidays to end but I love my house and it’s so much easier when you have all your things around you especially for Cole. He definitely missed his Jumperoo and his baby walker. Bobby was so excited when we came back to our house too, it was very cute. He kept saying things like “Our sofas are back” and “my toys are back”. I was more or less straight back to work to take part in the AOL Build Series London with Kate Thornton, Tamsin Outhwaite and Stacy Solomon. It was a filmed discussion on body image and body shaming and it went out live on AOL. It was lovely to be amongst so many confident and intelligent women and hear their thoughts on the issue. It’s more apparent than ever now with the addition of social media in our lives. It made me realise how lucky I was to go through my experience in Girls Aloud without the added pressure and influence of social media. Having your appearance judged in magazines was bad enough but to have hundreds of thousands of people able to comment on your appearance daily is far too much pressure for young people growing up in the public eye. In fact it’s not even about being in the public eye anymore. People have this to deal with in their daily lives now due to the impact of social media. Over the years I’ve always said that there is generally just too much obsession with people’s weight and appearance. I’ve never understood why journalists search for negative images of people and plaster it all over a website or magazine? I just don’t get it and I never will. The way I’ve always looked at it is, if people find comfort in a bad image of me then I can take it on the chin and find a positive in the situation. It’s more damaging when it’s a young person who’s not even famous posts an image and receives negative comments about how they look. I honestly feel women should always empower other women and if you don’t have anything nice to say just stop typing! On Thursday, Kimberley was invited to talk about Body Shaming on AOL Build Series London with Kate Thornton, Tamsin Outhwaite and Stacy Solomon. It went out live, and the ladies were discussing how social media has a big impact on the way you have to look. The video is over half an hour long, but Kimberley talks about how Louis Walsh bodyshaming Girls Aloud for being “too fat”, and revealing what she would say to her teenage self quiting fad diets. It was lovely to catch up with HELLO!’s editor Rosie Nixon at her book launch for Amber Green takes Manhattan at The Fleming Hotel. I’ve already packed it in my suitcase for my holiday read next week. I had a good chat to Giovanna Fletcher and Izzy Judd about all things motherhood. I’ve met them both briefly before but never had a chance to chat properly. It’s always nice to compare stories as we all have kids of similar age and their partners were both doing the whole promo trail in McFly at the same time as Girls Aloud so we have lots in common. Izzy has also just released her book Dare To Dream following Giovanna’s book Happy mum, Happy baby. Izzy’s is an account of her struggle to conceive her first baby. She has now fallen pregnant a second time naturally which is so lovely. I love how honest they have both been in their books on motherhood. I think it’s so refreshing and great for young mums to be able to read their books and find comfort in them. We took Bobby and Cole to the new CBeebies hotel at the weekend. It was a real family trip as Justin’s daughter Chloe also came. The hotel was amazing! Every room was themed and fully equipped with everything you could possibly need for young children. We stayed in the Postman Pat and the In The Night Garden rooms and Bobby couldn’t believe his eyes. He also met Mr Tumble which as most mums with young children know is like meeting royalty to kids! Bobby was chatting away to all his favourite characters from the show and wasn’t fazed in the slightest. He was completely wired by the time he went to bed but it was a such a fun night for him. Justin took the boys to CBeebies Land the following day with Chloe as I had to be up crazy early to travel to Liverpool to present British Style Collective. I managed to get myself up and out of the hotel at 5am so the car could take me to the Liverpool Echo arena and start hair and make up for the press call at 7am! It was such a fun event to host. 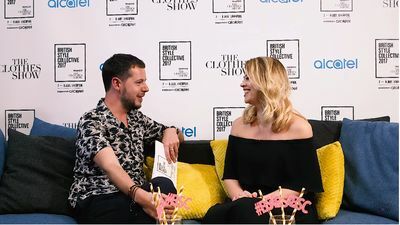 British Style Collective is made by the creators of The Clothes Show that was in Birmingham for years and years and it has been revamped, renamed and made its debut in Liverpool this weekend. It’s a huge celebration of British fashion with catwalk shows and fashion talks. It was such a fab event to be a involved in, I really loved it. I presented the two main catwalk shows at the Echo Arena and took part in a fashion discussion at the St George’s Hall with Jo Elvin, Caryn Franklin and Lisa Snowdon which was really interesting. The discussion was about dressing for success and how much what we wear actually impacts our confidence and how we feel. I don’t usually think that deeply about these things but it really is true that clothes really do massively effect how we feel. It was a buzzing weekend in Liverpool but I was glad to get home to my boys after an 18-hour day. We off on our holidays today so it’s been a mad rush to get everything sorted as you need to think about so much when you take a baby away but I’m so excited to take Cole on his first summer holiday!